Yup, I believe that's what he's sayin'. This is basic physics. Don't overthink it. If the front tires are solidly on the ramp, and you're not on any weird angles or slopes you should be good. I place my jack under the rear motor support and lift the back from there. The car will just pivot on the front hubs and the jack may roll a little forward as the car raises. 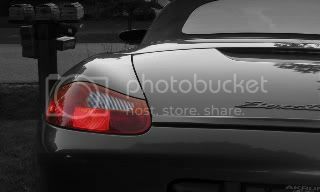 Put jack stands at the rear jack points on the side of the car. I don't know where you would put chocks, other than maybe a block of wood behind the front tires on the ramps if you like. As Frodo said, don't over think it. It ain't rocket science. I was a wood worker guy before I became a half-assed shadetree mechanic. 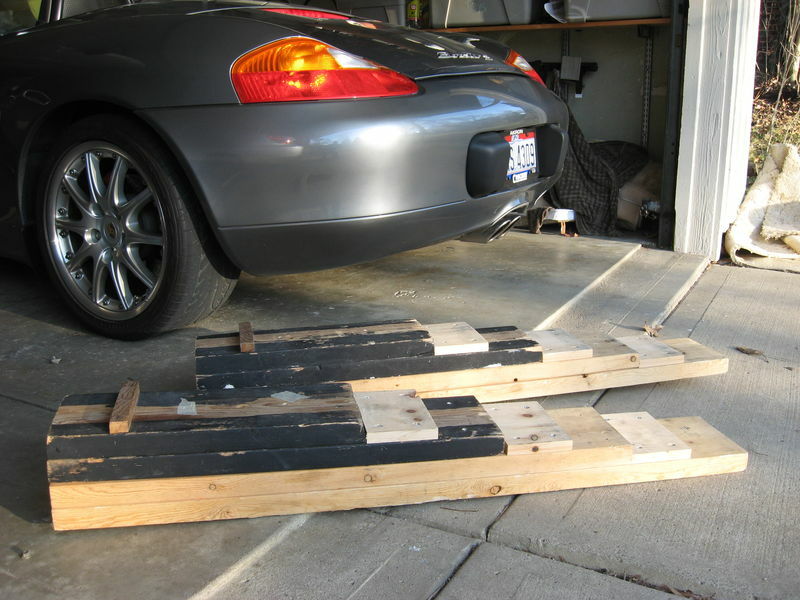 Shortly after acquiring the car, I built some ramps out of lumber I had lying around. They've served me well through the years. I had those little pieces on the top level to try to keep from driving off the top end. They were sufficient if I had someone on the ground guiding me up the ramps as I drove. But oftentimes I was wanting to get the car on the ramps when I didn't have any volunteers around to help me. Under those circumstances, those little strips were kinda inadequate. So I added some big honkers, as shown below. I suspect there's little chance I'll ever drive over them Plus, with the overhang of the newly added pieces, I've got something to grab onto when I go to pick the ramps up. So, as far as chocks go, I've pretty much got things covered at the end of the ramp. 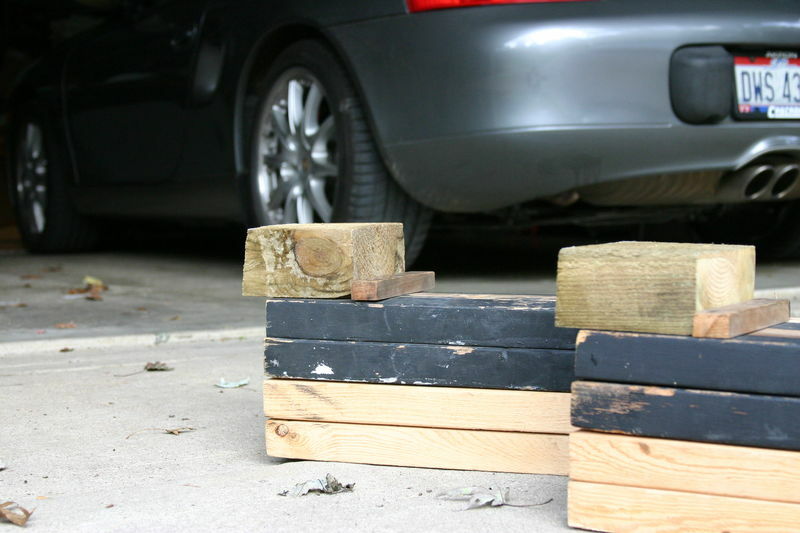 As far as the back edge of the tire, I've got little wedge-shaped pieces of wood here and there that I'll add as chocks to keep the car from rolling back down the ramp the way it came up. I've not used Rhino ramps, so YMMV with them. But they look like they're built so that the tires on the ramps will stay put once in place. 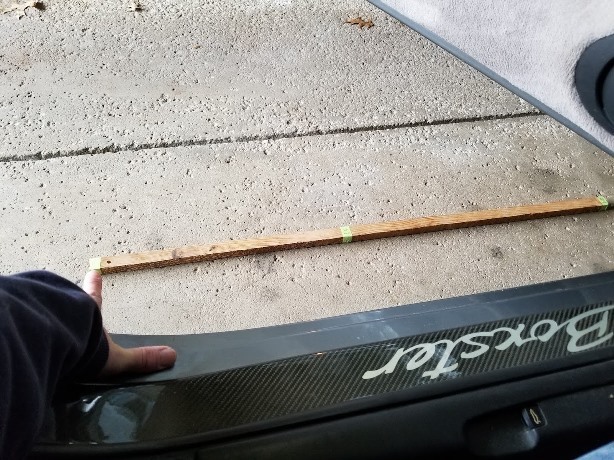 Just use some common sense when jacking the other end of the car: check the end on the ramps from time to time to make sure things aren't shifting in a way you don't want them to. They're not suddenly going to "foll off the ramps." You'll see the problem developing if you're paying attention. Last edited by Frodo; 12-27-2018 at 07:36 AM. At this point I ended up with four rhino ramps. Never tried driving up those ramps since usually I'm doing oil change alone. So you jack up the car and slide the ramps under? Haha I use to use one set with the ramps. I think the ramps are a little safer than my stands. Plus the jack point hold my jack as a precaution. Both works well but it seemed to me the jack stands were always a tad higher. I'll try driving up next time. A little tricky with a manual but obviously you guys are doing it. Yeah, ascending ramps on my own made me nervous the first time or two, but it's not too bad. Obviously, make sure you've got them aligned precisely, and well centered on each tire. The other thing that's helped me a lot is a measuring stick. Took an old piece of 3/4" x 1" and cut it to the exact length I need to drive to get up the ramp the distance I want to go. Once the ramps are in place, I position it as shown in the photo, point my finger at one end and let out the clutch. Obviously, when my finger reaches the other end I'm at my destination. It helps, because you don't want to be too hesitant in the driving process (esp with a manual---you tend to stall), but gunning it is nerve-wracking when you don't quite know how far to go. As you can see, there's a piece of green tape more toward the middle of the strip as well. 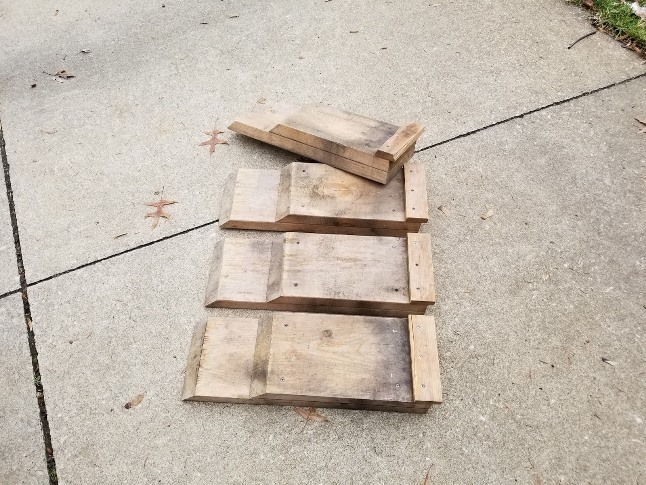 On a day that I apparently had more time on my hands than I knew what to do with, I made a set of 4 shorter ramps. They're handy when I wash, clay, wax, whatever the car. This old back of mine appreciates not having to bend over quite so far when tackling such projects Anyway, the shorter distance marked by the 'middle' green strip of tape is the distance for the shorter ramps. Last edited by Frodo; 01-03-2019 at 08:24 AM. If I don't need to remove the tires I always use the ramps on the end I plan to lay under. Some time trying to ascend in my garage I will squirt them out if the floor is dusty. Fortunately the Rhino ramps have a large lip on the end so you know when you have reached the edge.